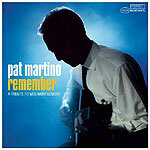 CD review: "Remember: A Tribute to Wes Montgomery"
Guitarist Pat Martino has had a remarkable journey  one that saw him rise to the top ranks of jazz players in the 1960s and '70s, only to lose all knowledge of how to play following brain surgery in 1980. He subsequently re-taught himself to play, and although it took years, eventually returned to his previous levels of virtuosity. Everything Martino has recorded since the surgery and comeback has been imbued with a joie de vivre, a deep appreciation for the simple ability to play. The late Wes Montgomery, who toiled most of his adult life in obscurity in Indianapolis before finally getting a national recording contract, had that same joy in his playing. And so Martino's new tribute to Montgomery is nothing if not full of pure joy. At times, that shared joy and the use of guitar are seemingly the only thing Martino and Montgomery share. Martino's style is not particularly similar to Montgomery's  he has a more intricate, busier approach than Montgomery's patented relaxed, fat sound. It's like the difference between Oscar Peterson and County Basie. So it's fun to listen to Martino tackle some of Montgomery's signature tunes: "Four on Six," "Full House," "West Coast Blues" from a pretty different perspective. If not all that much like Montgomery, the playing is of the highest order as Martino and his quintet run through the 10 songs.